The lion serves to protect Mary’s heart and give Mary the courage to continue working as a survivor in the area of dementia-care support and advocacy. The lamb represents Mary’s own woundedness and compassion with dementia- and long-term-carers. In the sacrifice, in the heart-ache, is the shared suffering and source for healing self and others. 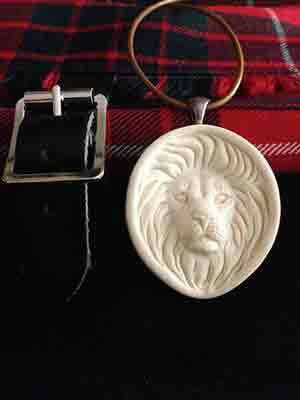 The two-sided Lion/Lamb pendant began as a body-felt heart-ache that bore a body-felt protective presence, experienced by Mary in February 2011, while visiting again for the first time (after her mom’s death) a local dementia-caregiver support group. Mary envisioned a pendant she would wear in front of her heart, that would contain a meek lamb in child’s pose on the inside, with the brave face of a lion on the outside. Together, they represent the paradox of Mary’s being wounded and fearless (fearlessness comes with the gift of losing everything, having nothing more to lose, and faith). Mary met with fine artist Terri Talas of Exeter, NH, USA to discuss the design and choose the raw material (from ancient fossilized bones and ivory) in March 2011. 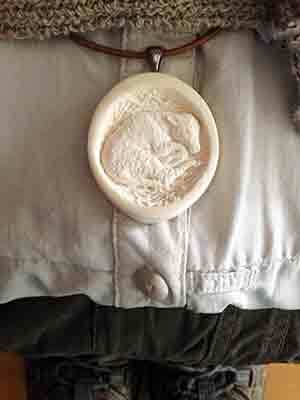 The mammoth ivory was hand-carved by Terri Talas and completed in June 2011. The khaki colors serve Mary’s role as a dirty fingernails gardener and landscape designer and reflect her Franciscan-oriented spirituality. Mary’s mom, Margaret Fraser, died at the age of sixty-seven from a frontotemporal degenerative brain disease (FTD). This disease primarily takes people at their prime of life (typically between the ages of 40-60). It is often a more rapid degenerative process than an Alzheimer’s type dementia. It is one of the rarer-forms of dementia that receives little attention and little research funding. Mary wears the tartan to honor her mom and to bring more attention to the disease FTD. Many health-system professionals are not aware of dementia’s impact on family members; they are not compensated (yet-as far as we know…) to do anything for family members; they rarely look at family members through a lens of caring-for-a-family-member when they are barely able (due to inadequate staffing, time-constraints, case-load-burden, and/or lack-of-training/knowledge) to appropriately care-for-the-patient. FTD is considered by experts to be one of the toughest types of dementia as far as its effects on a family. FTD created the perfect storm that set Mary’s world spinning out-of-control in 2007. The effects of FTD on Mary’s professional career, home, retirement savings, personal health, love relationship, extended family relationships, and friendships created the trauma from which Mary’s survivor’s mission, Marymac Missions, was born. The family’s role in caring for disabled family members (including persons with dementia) is largely unseen and uncompensated for in American culture. This needs to change. In professional practice, most healthcare professionals are working to help people with chronic or serious illness and disability, not their family members. Marymac Missions focuses on the holistic health of the family system when the family is experiencing long-term illness and disability. Some people living with dementia are realizing early-on,”I’ve got the family gene…” implying they aren’t happy about it. Living with memory-loss and its effects introduces a new, uncertain chapter in life that echoes the experiences of previous generations. More research is needed in this area so that we can stop the passing-down of dementia through the family tree.